This chapter pursues three goals. First, it overviews ­self-­determination theory (SDT). SDT is a macrotheory of motivation comprised of five interrelated minitheories—basic needs theory, organismic integration theory, goal contents theory, cognitive evaluation theory, and causality orientations theory. Each minitheory was created to explain specific motivational phenomena and to address specific research questions. Second, the chapter uses the student-teacher dialectical framework within SDT to explain how classroom conditions sometimes support but other times neglect and frustrate students’ motivation, engagement, and positive classroom functioning. Third, the chapter highlights student engagement. 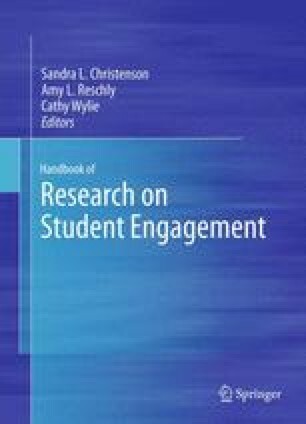 In doing so, it overviews recent classroom-based, longitudinally designed research to reveal three new and important functions of student engagement—namely, that student engagement fully mediates and explains the motivation-to-achievement relation, that changes in engagement produce changes in the learning environment, and that changes in engagement produce changes in motivation, as students’ behavioral, emotional, cognitive, and agentic engagements represent actions taken not only to learn but also to meet psychological needs. The chapter concludes with implications for teachers and with suggestions for future research. This research was supported by the WCU (World Class University) Program funded by the Korean Ministry of Education, Science and Technology, consigned to the Korea Science and Engineering Foundation (Grant no. R32-2008-000-20023-0).